An unassuming bar, somewhat off the beaten track, that’s full of charm and character – well worth a visit when in the area! 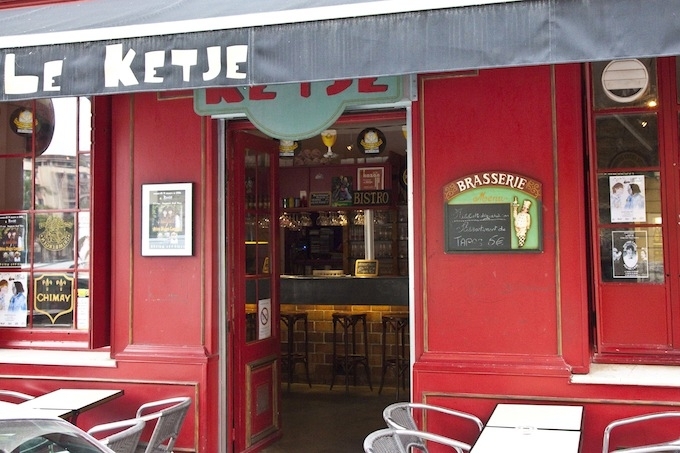 Le Ketje on rue Auguste Gal, just up from Place Arson and located not far from la Comédie de Nice, is a little bar that has a very individual and interesting character. It is very reminiscent of the semi trendy places you find in London that are a little out of the way and invariably inhabited by student types and artists rubbing shoulders with locals. The regulars are people who would prefer to talk about anything other than who they are – which is novel and refreshing in itself. No tourists, unbelievable, but true. I know one very well known expat artist based in the Port who uses this as his local, you would never guess what he did if you met him there. Some tables outside, a small squeeze of a bar area inside. Let’s use the words cosy, intimate, although snug is probably bang on. There is also a back room, you sort of guess there will be, as it is just that sort of place. A few weeks ago I saw Agnes, an accomplished jazz singer who is simply wonderful, perform on the small stage area. It is great place for musicians to play as they can jam or test out new stuff. Equally it works as a small theatre venue. Here is a thought – if you have ever thought of doing something (legal!) in front of a small invited audience, then I think we have found the venue for you! Why not? The owner, Titi, knows everyone of his customers by name. He is very approachable and friendly, which pretty much sums up Le Ketje – approachable and friendly – that works for me. A comfortable place to be. So if you are looking for pre-dinner drinks, going to la Comédie de Nice (which you should at least once) and want something hors sentiers battus, just somewhere different where your guests will say in amazement ‘how did you find this place, you really do know the area‘, or simply a place for a quite drink in good company, then Le Ketje works. Dress down for this one. Monte-Carlo Rolex Masters – Number Nine for Rafa?